Yvonne Pat Wright returned to live in the United Kingdom from Jamaica in 2006. She fulfilled her desire to write by taking a course in creative writing. From Spice to Eternity is her first book, and she has plans to follow this up with a sophomore book. Yvonne: I was born in Kingston, Jamaica, and lived there for the first twenty years of my life. By the time I left to go to England, I was married and had two daughters. I matured in the UK and sometimes I feel I am more anglicised than Caribbean, but I cherish my Jamaican roots and will never relinquish them. I’ve worked in real estate, the world of media, radio and advertising. I seem to shift bases in twenty to twenty-five year cycles. So it was the UK for twenty-five years, Jamaica for twenty years, and now the UK for the remainder of my life, I believe. A devout Christian, I teach Bible Studies and am a Lay Preacher. Yvonne: I have always been a scribbler. In school I did a lot of essays. I remember, in boarding school, a group of us would gather round and I would read. In much later years, I did poems, none of which were published. I produced church magazines and ended up writing most of the copy when there were not enough submissions. From Spice to Eternity was my first attempt to do substantial writing, and because of the genesis, it had to be non-fiction. I can see myself moving into the biblical saga type novels, which is the plan for my second or third book. Yvonne: In whatever sphere, my aim and goal for the reader, the listener, is to come away thinking that there is something better to be had and having a desire to obtain it. Yvonne: From Spice to Eternity is probably part one of two parts. It is a collection of inspirational true life stories drawn from my life and the lives of family and friends. The theme for the story is based on the characteristic of a herb or spice, which is described at the beginning of each chapter. The story is rounded off with a delicious spicy or herby recipe. Yvonne: I think I prefer a limited POV, and I rather like to use the ‘show’ rather than the ‘tell’ style of writing. How does your environment/upbringing colour your wrting? Yvonne: So far, I have written from my experience and the environments that I am very familiar with. I am likely to always anchor on to a very familiar aspect of my environment or upbringing as I am very comfortable in that zone. Share the best review (or a portion) that you’ve even had. 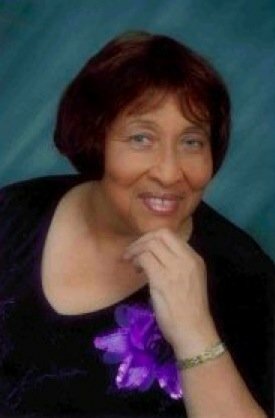 The passion for both her cooking and her faith has allowed Yvonne Pat Wright to write a marvelous book that is both a cookbook and a devotional to God. Each of the forty-two recipes for cooking has an accompanying recipe for living a Christian life. The author first gives a description of an ingredient used in a cooking recipe. Not only are the ingredient’s uses given, but also given is a brief history or tradition concerning the ingredient. The author then gives an ingredient that can be used to build your faith. This is cleverly done through relating something about the cooking ingredient to the associated life ingredient. And it is done very effectively. The very first ingredient listed is vanilla. The author tells us that vanilla is called “the spice of love.” This fact is used to transition the reader into a spiritual thought: “Like the long process of curing vanilla, love affairs – especially those that endure – develop over a long time, the longer the process, the more precious the love that ensues.” Then the reader is drawn into an engaging story that leads to a spiritual truth. For vanilla, the truth is that God loves more than we could ever hope to love. At the end of the vanilla section is a tempting recipe for a “Rainbow Parfait.” This is typical of each section of the book. The author shows expertise in both cooking and in Christian living. Her book has value in both the recipes that are presented and the life lessons that can be gleaned. It is perfect to use as a devotional. The length of each section is just the right length to glean a daily spiritual thought. These thoughts are as inspiring to the Christian as the recipes are to a cook.The lasting value of this book is found in both aspects that it presents. The recipes will be sure to please and can be used time and time again. Likewise, the nuggets of truth contained in the book’s well-crafted and inspirational stories can be a valued source of devotional truth each time that it is read. By Walter Mark Author of the Sixth World of Men book series. 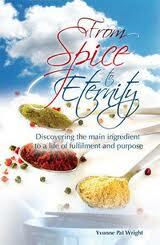 Yvonne: Vigorous promotion and marketing of From Spice to Eternity, a sequel, and a biblical adventure story. Thank you for joining us today, Yvonne! Yvonne: Thanks so much for the opportunity. I really appreciate it.